Five piece wedding and event band that literally create the best party atmosphere you've ever seen. The VIPs are dynamic, exciting and fun. We are a fully live wedding band playing Dublin and country-wide weddings and corporate functions every week of the year. We will keep your dance floor heaving from start to finish. The VIPs have it all, and can operate both as a five piece (all male) and a six piece (with a female singer added). Our playlist is exciting and geared to keep you dancing! 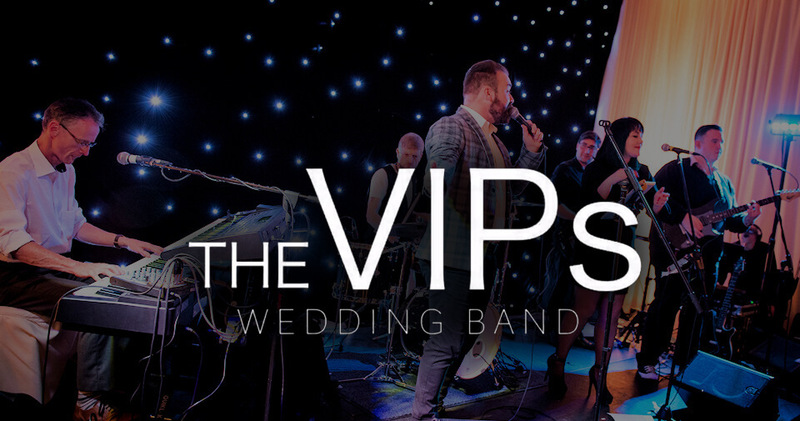 The VIPs wedding band cover all the best contemporary chart tunes, 80s and 90s dance anthems, as well as popular wedding classics to keep all ages happy. Not only do we provide a band with the wow factor – our DJ will keep the party going until the wee hours. The VIPs provide Ceremony and Pre Dinner reception music and have various options to offer you. We will work closely with you from time of booking, through to your wedding day. If you are looking for Ceremony music that your guests will be talking about long after the big day, the VIPs can offer different options. As we are in high demand, we are delighted to offer you a choice of singers and musicians for your ceremony. Each unique in their own way. After all the planning is done, your Ceremony is actually THE most important part of the the day. This is where you pledge to be with the love of your life forever. It is important to choose Ceremony music to complement the sentiment of your Ceremony – we help you put this together, and are constantly on hand to chat if you have any questions. * This is a FREE service, there are absolutely no fees, commissions, hidden charges or otherwise, and The VIPs Wedding Band will respond directly to you. We respect your privacy, you are not signing up for a newsletter or spam, and your enquiry goes only to The VIPs Wedding Band. The VIPs is feeling excited. The VIPs is with Antoinette Dunleavy and Alan Fitzsimons. The VIPs shared a post. Just a quick note to thank you for your support with our recent awards night. The band went down a treat and had the dance floor full for the night!! One other thing to point out was how professional & organised they were. The team and I didn’t need to worry about set up or timings, they were ready and waiting without having to run anything by them. Again many thanks and please pass my gratitude on to the band. “Wonderful band! Professional from start to finish. Very accommodating with all of our requests. Our guests had a great time! Would definitely recommend them! I hope you are keeping well? Thank you so much for your email. I have been meaning to contact you and want to apologies for the late feedback. I have finally got to sit down and tell you how AMAZING the VIPs were on our wedding day!!!! Where to start.... From the first meeting with you all over in the Red Cow which was where the excitement kicked in. We sat at the bar, enjoyed a drink and listened to really fantastic entertainers for that short period of the showcase. The VIPS were the first band we went to see and we were so so happy with the variety of songs played. When you told us that you were available on New Years Eve 2017!!!! Within 24 hours we had booked!!! We decided to go again to another showcase a few months later and we both came away saying "didn't think they could get any better but they sounded even better tonight!!!" Communication was fantastic with the band, to see what songs we were happy for the band to play on the night and also to note the songs that we decided for the band not to play. The DJ songs also were all perfect. I suppose the biggest task for the band was to learn the exact version of our first dance song "Pretty Women" Rob Orbison. THANK YOU THANK YOU THANK YOU!!!!!! Each note, harmony and beat were exactly as we wished and practised our first dance resulting in such a fun and upbeat first dance song. After that the dancefloor was pretty much full for the whole night. As for the NEW YEARS EVE count down for 2018... the band had the whole crowd up on the dance floor and the buzz was just epic!!!! Dwayne and I are married exactly two months tomorrow and we will remember the whole day especially the VIPs forever. Wishing you all the very very best in your wedding band journey. We really hope we get to see you at another wedding in the near future and 100% we will recommend you. You are very welcome to use any or all of the above for any testimonials.